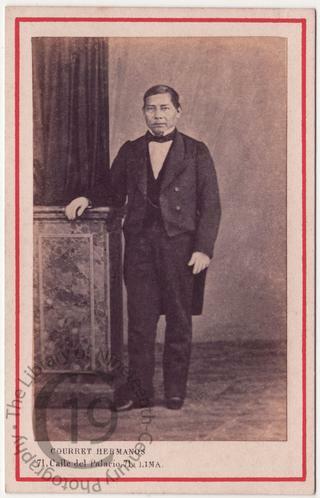 A carte-de-visite portrait of the Mexican politician Benito Juarez (1806-1872), who twice served as president of Mexico (1861-1864 and 1867-1872). In 1861 Juarez suspended repayments of Mexico’s foreign debts, which prompted a joint French, English and Spanish expedition to exert pressure. French forces invaded and created an 'empire' for Maximilian, brother of the Austrian emperor. After their withdrawal in 1867, Maximilian was executed and Juarez returned to the presidency. Photographed, or at least published, by Courret Hermanos of Lima, Peru.